** Kit Includes:Converter 110V AC, 5 Cell Battery Pack, 2 Detachable Mounting Brackets, Charger, Power Cord. 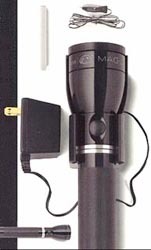 ** Candlepower and battery on-time can vary due to manufacturing variations in lamps and batteries. (PBC) Peak Beam Candlepower. Lamp life may vary.